The 2011 Annual 5 by 7 Show was proudly sponsored by Karen and Les Walker, and the Woodstock Framing Gallery. An exhibition of work that hovers between abstraction and representation – mostly abstract which is suggestive of something, often on the verge of recognition but not clearly defined. It also includes mixtures of abstraction and actual representation and mixtures of materials. Curated by Carol March. 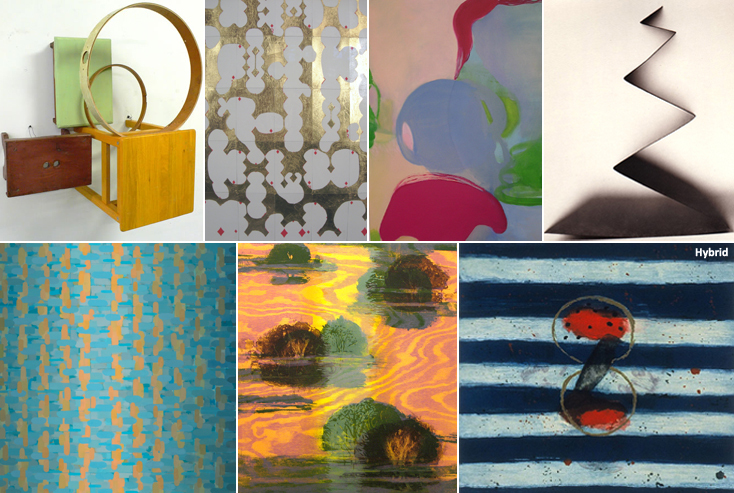 The artists in the exhibition are: Squeak Carnwath, Don Christensen, Michael Mazur, Patricia Spergel, Eleanor White, Rachael Wren, and Ion Zupcu. Exhibited all around White Pines at the Byrdcliffe Art Colony. 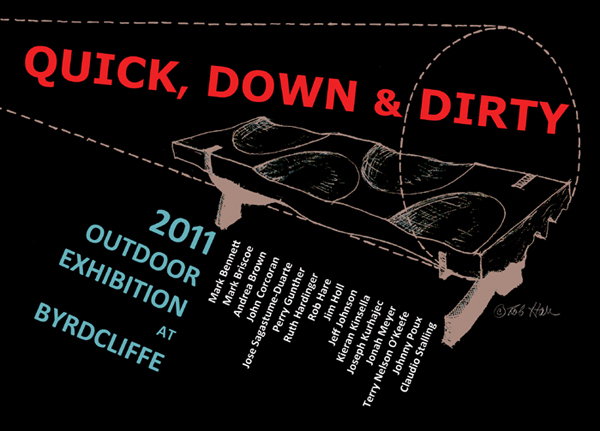 Quick, Down & Dirty will focus on outdoor furniture and landscape/garden accessory constructions, many of them site specific. The premise of the exhibition relates to the increasingly stringent conditions facing designers and craftspeople in current times, namely: limited resources, tight schedules, and an overriding concern to protect our planet’s resources by using them wisely (in other words, “building green”). The Byrdcliffe site adds an element of “rough outdoor conditions”, making this exhibition challenging to the furniture makers, craftspeople, and artists participating. “Each artist/participant will face many ironies rushing to beat the clock”, observes curator, Alan Baer,… ”many creative people thrive on pressure and experience aesthetic breakthroughs when faced with a small budget and scarce time to execute.” Curated by Alan Baer. Participants in the exhibition are: Mark Bennett, Mark Briscoe, Andrea Brown, John Corcoran, Jose Sagastume-Duarte, Perry Gunther, Ruth Hardinger, Rob Hare, Jim Holl, Jeff Johnson, Kieran Kinsella, Joseph Kurhajec, Jonah Meyer, Terry Nelson O’Keefe, Johnny Poux, Claudio Stalling. 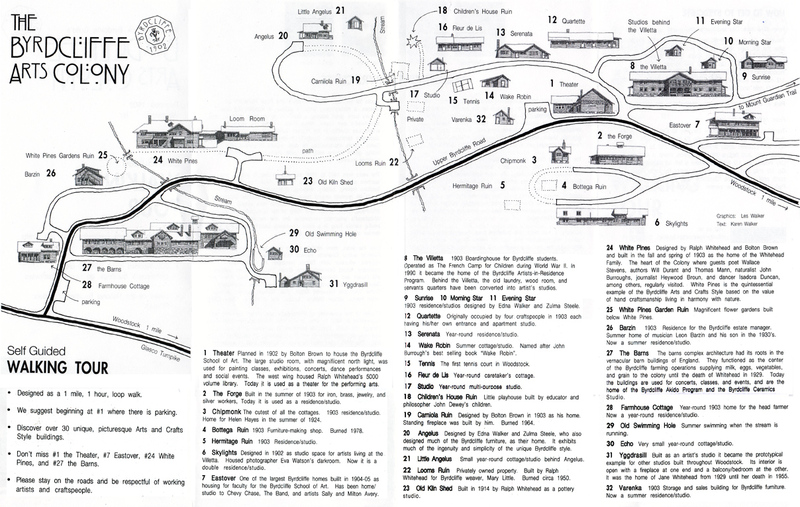 Exhibition Dates: July 16 – November 6, 2011, with the Opening Reception at White Pines on Saturday, July 16, 4:00 – 6:00 pm, and anAutumnal Celebration on Saturday, November 5, 1:00 – 3:00 pm, also at White Pines! Read a review on QUICK, DOWN & DIRTY by Paul Smart in the Woodstock Times (July 14, 2011)! Eccentric Portraits is not your usual portrait show. It honors the artist’s license to interpret their subject rather than render it conventionally. The results are images that range from humorous, to weird, to perplexing, although all are unorthodox and unexpected. 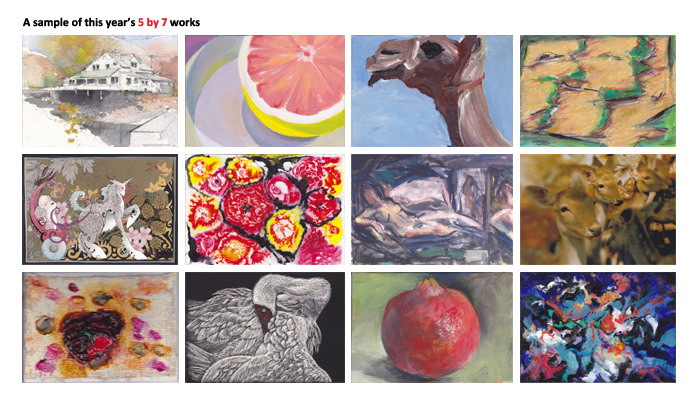 Curated by Nancy Azara and Sylvia Leonard Wolf. The artists in the exhibition are: Barbara Bachner, Loel Barr, Elizabeth Bisbing, Bette Blank, Richard Butler, Didier Civil, Lulu Ekiert, Laura Elkins, Yale Epstein, Peter Franceschetti, Reiko Fujinami, Bo Gehring, Brenda Goodman, Arthur Hammer, Amy Hill, Martha Hughes, Nicole Jeffords, Lenny Kislin, Polly Law, Jason Lujan, Mari Lyons, David Marell, Eva Melas, Ann Pachner, Alan Siegel, Eleanor Steffen, Melinda Stickney-Gibson, Michelle Stone, John Tomlinson, Virginia Tyler, Carl Van Brunt, Rob Van Erve, Catherine Welshman. 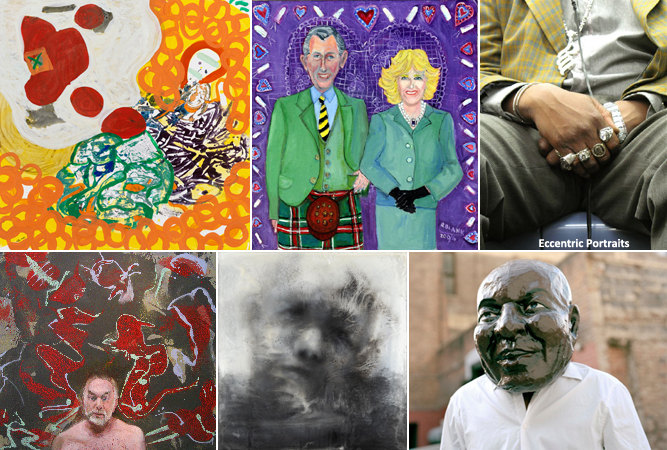 Read an article on the Eccentric Portraits exhibit and other art shows in Woodstock by Paul Smart in the Hudson Valley Times (September 8, 2011)! How do artists today utilize digital technologies as a means of expression? In presenting a selection of artworks by artists who engage computers as an integral part of their creative process, this exhibition showcases diverse practices in the making of traditional art such as sculpture, photo-collage, drawing and painting, as well as relatively new forms inspired by the possibilities of digital technology such as animation, gaming and interactivity. The emphasis here is on the content of the artworks and their realization both in concept and craft. Curated by Jimi Billingsley. The artists in the exhibition are: Jeremy Blake, Jasper De Beijer, Carla Gannis, Claudia Hart, Kim Joon, Mary Mattingly, Alex McLeod, Peter Patchen, Michael Rees, Alexander Reyna, Thomas Ruff, Mary Ann Strandell, and Ruud Van Empel. 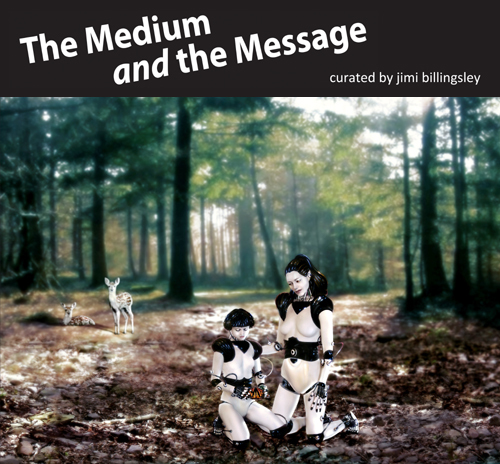 Read a review on The Medium and the Message by Peggy Roalf in Design Arts Daily (July 26, 2011)! Read an article on The Medium and the Message by Paul Smart in the Hudson Valley Times (July 28, 2011)! 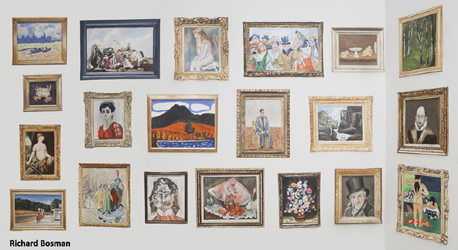 An installation by painter Richard Bosman of copied historical paintings, exploring how changes in scale, surface and gesture change the meaning of the works. Other paintings are a personalized view of famous artists’ studios. “I’m interested in how the artist’s environment contributed to their work”, states Mr. Bosman. Curated by Portia Munson. Read a review on the Richard Bosman exhibit by Paul Smart in the Hudson Valley Times (July 21, 2011)! A group exhibition of multiple mediums including painting, sculpture, photography and more addressing the Gun. The very word “Gun” is “loaded”. Guns are seemingly omnipresent in 21st century American mass media, news, entertainment and also in video games and toys. Guns and our gun culture are controversial. The topic is packed with moral, ethical and legal issues, making guns prime material to which artists respond. It is impressive how many artists have used guns in their work. When the subject arises, it brings up radically differing points of view. Curated by Katharine Umsted and Portia Munson. Read a review on the GUN SHOW by Paul Smart in the Almanac Weekly (May 12, 2011)! Woodstock Byrdcliffe Guild’s annual eclectic exhibition, showcasing the winter’s work of our artist members, in all media and methods.